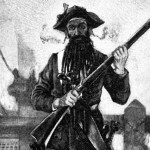 In the early 1700’s, Blackbeard was the most infamous pirate to sail the Virginia and Carolina coast. 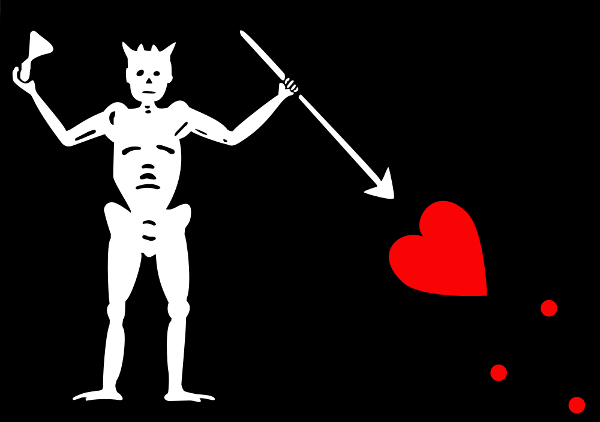 The sight of his ship with its black flag showing a skeleton, a spear, an hourglass and a heart dripping with blood, caused most merchant captains to hoist the white flag of surrender. 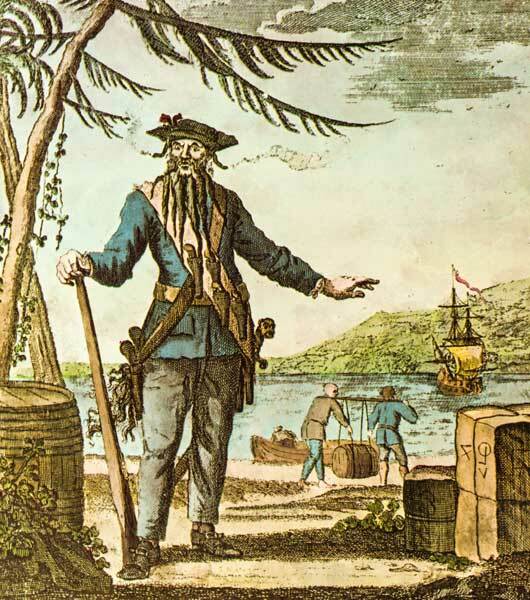 Not much is known of Blackbeard’s early years. 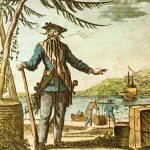 He is believed to have been from Bristol, England and his real name is widely thought to have been Edward Teach (or Thatch). 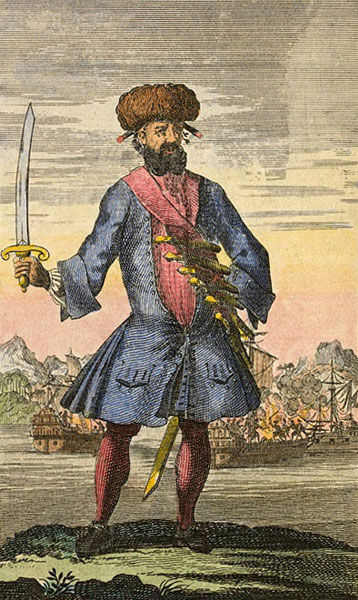 Recent research even suggests that Blackbeard may have been a native of Bath, North Carolina, the son of the Captain James Beard, adjoining property owner and close personal friend of Governor Eden. 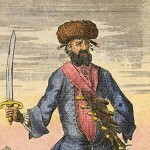 Blackbeard was famous for his demonic appearance. 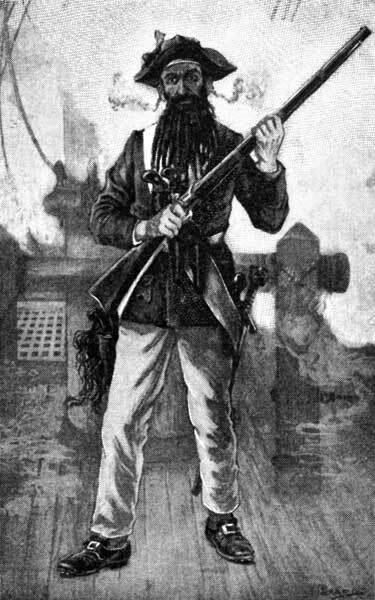 With bandoliers of pistols strapped to his chest, daggers and cutlass at his side, his long coal black beard braided and tied with blood red ribbons, slow-burning fuses sending sulfurous smoke wafting from under the brim of his tri-cornered hat, and the rage of the devil himself in his eyes, the mere sight of Captain Blackbeard and his black flag showing a skeleton, a spear, and hourglass, and a heart dripping with blood, sent most merchant captains scurrying to hoist the white flag of surrender. 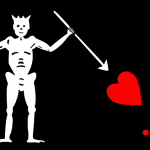 In September of 1718, at the height of his career, Blackbeard hosted the largest gathering of pirates ever to assemble in North America. 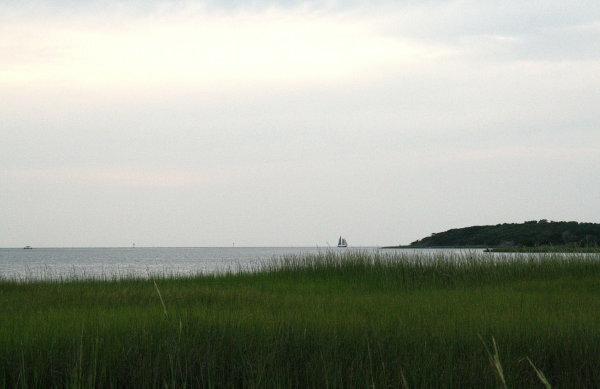 On the soundside beach near Ocracoke inlet scores of outlaw sailors sang and danced, roasted hogs over open fires, and downed uncounted tankards of rum. 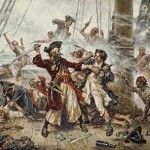 The raucous party lasted for days, ending only when food and drink ran out, forcing the sailors back onto the open seas. 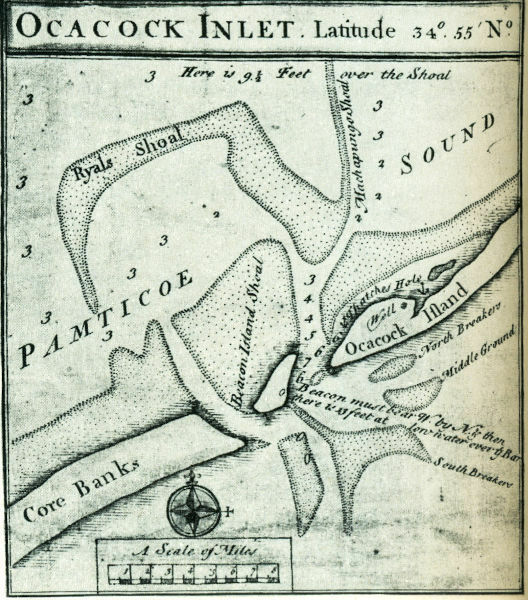 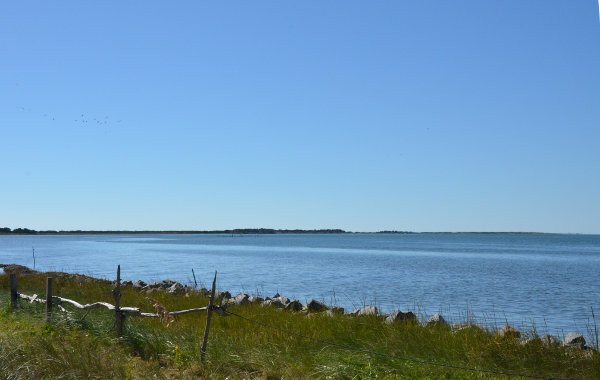 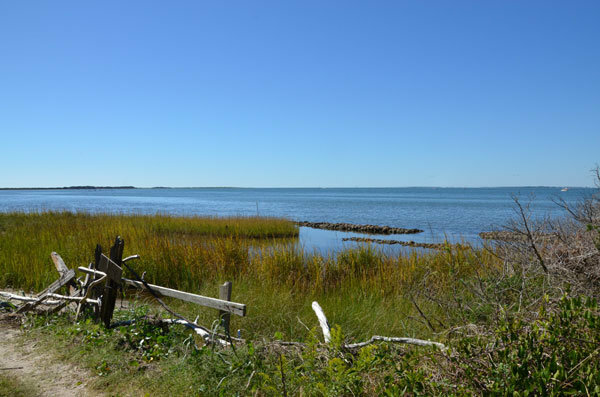 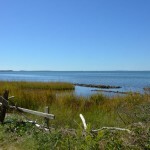 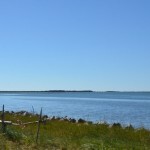 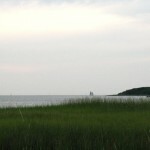 Only two months later, on November 22, 1718, Lieutenant Robert Maynard of the British Royal Navy, sent by the governor of Virginia, Alexander Spotswood, met up with Blackbeard in a deep water channel just off the shore of Springer’s Point. 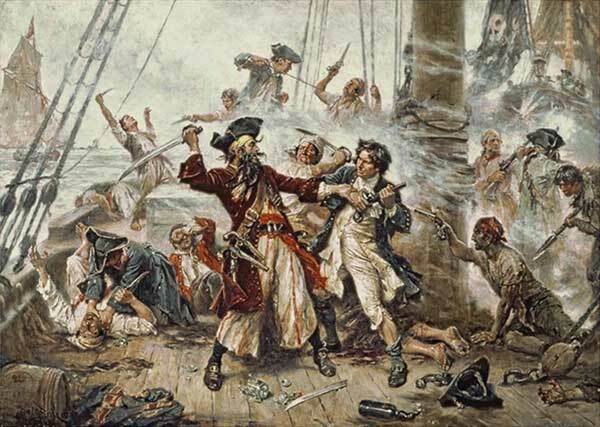 After a fierce battle, replete with frantic hand to hand combat, Maynard’s men overpowered the smaller pirate crew. 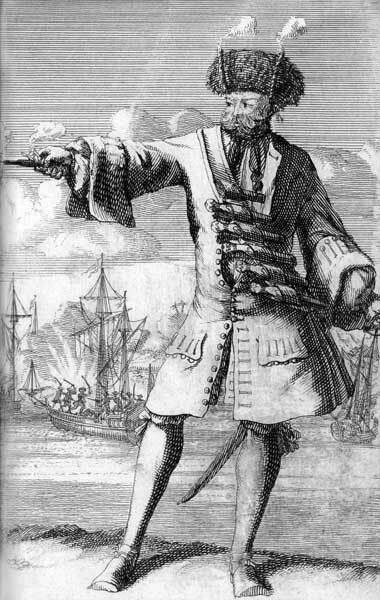 It was said that Blackbeard took twenty-five wounds, from pistol, sword, and dagger, before a cutlass slashed through his massive neck, and he slumped, headless, to the deck. 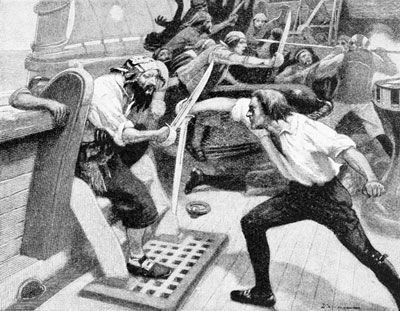 The fighting over, Maynard tossed Blackbeard’s body over the side of the vessel. 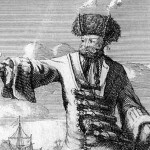 According to legend, the surviving pirates watched in amazement as their captain’s headless body swam around Maynard’s ship before finally slipping into Davey Jones’ locker. 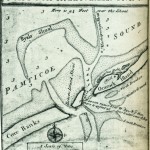 With the disembodied head of Blackbeard hung from the bowsprit of his sloop, Maynard sailed out of the channel (soon to be dubbed Teach’s Hole) and on to Bath, then Williamsburg, and finally to Hampton, Virginia, where the Blackbeard’s head was impaled on a stake at the entrance to the harbor, a grisly warning to any sailor who doubted that the Golden Age of Piracy had come to an end.